The Las Vegas Marriott, 325 Convention Center Drive, is an upscale luxury hotel, within walking distance of the Las Vegas Convention Center and the monorail. The Las Vegas Marriott is an upscale luxury hotel, which sits at the very heart of the legendary Las Vegas Strip: within walking distance of the Las Vegas Convention Center and the monorail that people use to get around town. This makes it the perfect spot for anyone who wants to have a fabulous time during their Vegas stay, be it for business or pleasure. The hotel provides an excellent array of amenities, including a crystal clear outdoor swimming pool, the perfect place to go for a refreshing swim during the Las Vegas summer. This combines with a state of the art fitness center, for those who want to maintain their usual regime during their Vegas stay. Alongside free parking and easily accessible WIFI that can be found throughout the property. The hotel also features a free tasty breakfast in their own restaurant, which also provides lunch and dinner too. Finally, there are plenty of refined spaces, which can be used for business functions, seminars, and weddings. The accommodation is spacious and modern, with luxurious ensuite bathrooms, soft fluffy bedding and mini-fridges, and bars. However, the highlight of the lodgings is unquestionably the spectacular views all across Sin City. 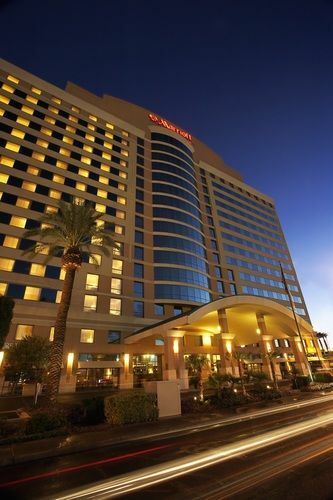 The Las Vegas Marriott, is a great spot for business people and pleasure seekers alike, providing luxurious and well-located accommodation, which will fulfill every single one of your Las Vegas needs. 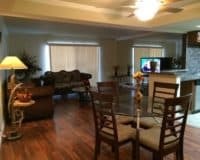 Within 1 mi (2 km) of Las Vegas Country Club, Las Vegas Convention Center, and Fashion Show Mall. Within 3 mi (5 km) of the University of Nevada and Thomas and Mack Center.